A pair of magpies frequent the rowan tree outside my window. One morning this winter they were huddled together on a branch, their white breasts gleaming together in the sunlight. I often see one silhouetted atop a spruce in the distance – a striking tree-topper. Last month I saw one of them struggling to remove a branch from the abandoned magpie nest in the rowan, and fly with it across the street to a tree in the alley – an early sign of spring! Three weeks ago this pair were chasing a harassed little red squirrel through the rowan tree (all our squirrels are little and red). Today a blue jay alighted in the tree with what appeared to be a peanut shell in its mouth. Before long this pair arrived on the scene and chased the jay around the yard and out of sight. This entry was posted in life, nature fix, urban nature-pockets, winter and tagged animal antics, birds, harbingers, sightings on February 26, 2016 by misshermit. The sun is especially warm today and the backyard filled with spring-like sounds of dripping water and bird song. A dozen chickadees twitter and flit from a large puddle in the icy garden to the oak branches above, busily grooming. It’s the great backyard bird count and what do I see? The neighbourhood magpie and 3 chickadees. Midway between equinox and solstice, the dark time of the year begins. And right on cue, the first snowflakes fall from the sky, beautifully drifting down at a meditative pace. The leaves have dropped from most trees, leaving behind decorative bright red berries or helicopter seed pods. In nature lore the sacred Crone mourns the death of her spouse for the next six weeks, until the solar babe is born and the light begins its annual growth. A time of peaceful reflection, rest, and waiting. This entry was posted in autumn, life, nature fix, urban nature-pockets and tagged flora, sightings, Snow, Wheel of the Year on November 2, 2015 by misshermit. 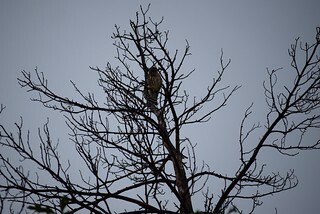 This spring the raucous call of a merlin could be heard echoing through my neighbourhood. I’ve seen the small hawk perched in trees and soaring over the block throughout the season. In the past two weeks a group of three appeared as a prominent presence – perhaps a fledged family – an adult pair with a juvenile, or an adult with two juveniles? 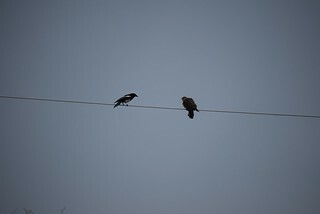 They call to each other as they swoop through the neighbourhood. The activity is centred one block east of mine, so perhaps their nest was in a backyard tree in that block. Apparently they like to move into old magpie and crows’ nests – and certainly there is an abundance in this neighbourhood. We had a crow family raised in a pine at the park a block away, and there were at least three magpie families in the immediate neighbourhood this year, as every year. This entry was posted in life, spring, summer, urban nature-pockets and tagged birds on August 1, 2015 by misshermit. This entry was posted in nature fix, spring and tagged birds, Equinox, fauna, flora on March 22, 2015 by misshermit. Ambling along the sidewalk by the river valley, hidden from view by the snowbanks lining the walk, my dog and I came upon a short-legged, shaggy animal with a big round body, somewhat larger than a large domestic cat. It seemed to be a uniform dark colour. Its tail was flat and angled down toward the ground from its body. The tail was about half to two-thirds the length a cat’s would be, relative to the body size. Although it rolled from side to side in quick, waddling steps, it progressed slowly down the path – clearly not an animal that relies on speed. Skunk tracks had criss-crossed the neighbourhood last week, so that was my first thought, but its tail and markings were different from a skunk’s. The tail wasn’t fluffy and there were no tell-tale white markings on its back or tail. I think it was a porcupine, or possibly a woodchuck, newly emerged from hibernation. Maybe a young one, given its size. I kept our distance, since my dog was along, so we didn’t get close enough to confirm. This entry was posted in life, nature fix, spring, urban nature-pockets and tagged animal antics, fauna, harbingers, sightings, tracks on February 24, 2015 by misshermit.